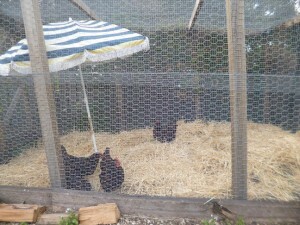 Self Contained Holiday Cottage Close to Hobart with Chooks! Guests love staying at 19 Blue our Holiday Cottage in Blackmans Bay. There are so many reasons why it is so popular but one of them would be that guests can come down and visit our four Barnevelder chickens and bring them any food scraps they may have. We call them The Alices because we can’t tell them apart. The Alices live the life of Reilly with a sun umbrella to protect them on hot days or rain and straw to scratch around in.